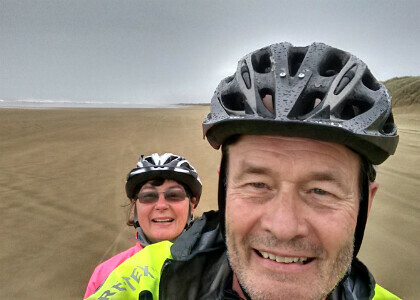 This February, nearly 40 years after receiving their first tandem bike, Mark and Jutta Brayne will cycle the length of New Zealand to raise funds for the Rory Peck Trust. We spoke with Mark about their preparations for the ride and why they chose to support freelance journalists. We will be updating this blog as they undertake their journey. 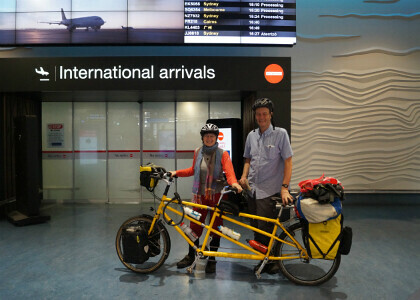 Safely touching down in Auckland on February 5th, Mark and Jutta Brayne began their tandem ride across New Zealand in support of the Trust just a few days later. 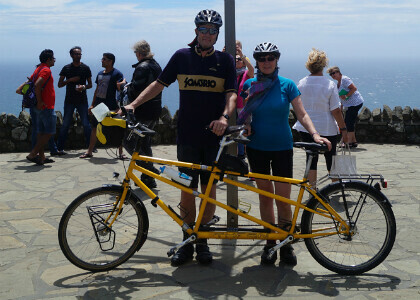 Despite a few technical difficulties - treacherous high tides, downpours, saddle sores and sunburn - they got off to a great start at Cape Reinga, and are now over two weeks into their tour. "It’s good to know that however absurd I feel I might look, we’re doing this for a higher purpose - raising money for the so very worthwhile Rory Peck Trust," says Mark. Him and Jutta are just over half way to their funding goal of £3,000 - that's £1 for every kilometre pedalled. They would love to make the big total in time for their arrival in Bluff at the bottom end of New Zealand before Easter. Support them by donating through their Just Giving page! Mark – why are you and Jutta doing this?! 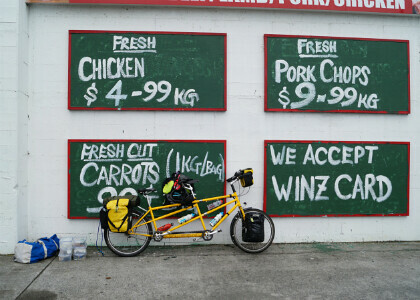 As anyone who fundraises for a crazy challenge like this, the main reason we’re taking our tandem 2000 miles/3000km the length of New Zealand through February and March 2016 is to have an awesome time! 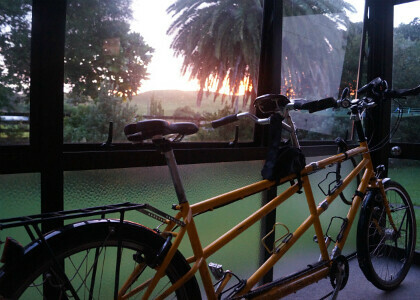 We both love cycling, and after various solo trips around Europe and NZ this is our ultimate opportunity in our mid-60s to have the cycle trip of a lifetime. As we planned the trip, we had the idea to raise funds at the same time for our favourite charity. After considering various worthy causes we opted with enthusiasm for the Rory Peck Trust. What is your connection to the Trust? And to freelance journalists? I first encountered Tina Carr and the Rory Peck Trust whilst working with John Owen at the Freedom Forum in London around the turn of the millennium. We were all keen to explore and support the experience of journalists exposed to and reporting trauma. I quickly saw how vulnerable freelancers were in particular without the support and backing of a big organisation or team behind them. It’s increasingly freelancers - and often very young ones - who are furthest out there in the face of trauma, left with the toxic emotional impact of witnessing the worst things human beings can do to one another. Why do you think freelancers are so important to newsgathering? Without freelancers, we would all be so less well informed about the major developments shaping our world – I’m thinking particularly of the situation in Syria, the rise of ISIS and the continuing refugee crisis. By supporting freelancers and promoting their safety and welfare, the Trust’s work sits right at the heart of all of this. Like them, we believe that freelancers play an important and integral role within newsgathering and see the Trust’s role in protecting and supporting them as a practical and significant contribution to independent journalism. All of us working in the news industry – especially news organisations - have an ethical obligation to support them. After all, it is we who rely on them. What’s your experience of working in the news industry? As a Leeds language graduate with fluent German and Russian, I worked for Reuters in Moscow (where I met Jutta in 1974) and then East Berlin, followed by stints with the BBC in West Berlin, Vienna and Beijing. Jutta was with me all the way. We returned to London in 1988 where I worked as BBC World Service Diplomatic Correspondent. By the end of the 90s, I was heavily involved in the BBC’s hostile environment training programme, and as a budding psychotherapist was pushing as hard as I dared for training and awareness around emotional injury to be included in mainstream BBC thinking. In 1999, whilst researching my Masters Thesis on the Personal Experience of the Foreign Correspondent, I got to know folk from the Dart Centre for Journalism and Trauma in the US, the only outfit then dealing with this stuff full-time. During this time, I met Tina and the Rory Peck team, who enthusiastically supported the setting up in 2002 of a Dart Centre Europe based in London. I left the BBC in 2003, moving into full-time work with Dart and as a psychotherapist specialising in trauma – with journalists of course, but also with ordinary human mortals. How much are you hoping to raise from the ride? One pound for every kilometre we travel seems a fair target – 3000 km, or around 2000 miles, which will add up to around £3,000. Jutta and I hope this will help the Rory Peck Trust to develop the support they already offer freelancers – physical and financial, but also emotional. Mark and Jutta – thank you, and best of luck from all of us at the Trust! ​Mark and Jutta have so far raised almost half of their target, with a month still to go before they leave. To support their fundraiser, please donate via their Just Giving page here.